East Bali juts out into the sea like the nose of a giant fish; its coast offers breathtaking scenery. Located on a perfect little bay, tiny Padangbai is a fishing village and the port for ferries from to Lombok and the Gili Islands, as well as passenger boats to Nusa Penida Island. Ask how to get to Padangbai’s "secret beach" and really get away from it all. A walk from one end of town to the other takes just ten minutes. Take time to choose one of the many places to stay or eat; they’re all very close together and very affordable. Yet another beach can be reached by climbing the hill on the other side of the village - just follow the signs for Bloo Lagoon. Bloo Lagoon Villas and Resort has a restaurant with great sea views, and serving fabulous seafood. It's also a great place for snorkelling. Masks and flippers can be rented here, and they have their own boat to take divers out to the better dive spots. If you prefer, you can rent a boat at the main beach for a trip to the lagoon. Diving is also possible; the best operator is Gecko Dive Centre (0361-41784) at the main beach, but check on water conditions before you pay because tidal changes and time of year can influence visibility. You may also notice the temple Pura Silayukti, where Empu Kuturan - who introduced the caste system to Bali in the 11th century - is believed to have lived. The temple is often the centre of huge festivals, during which villagers dress up in their finest sarongs and kebayas, and groups of women carrying elaborate offerings can be seen all day long. A short distance to the north along the bay is the resort town of Candidasa, where life's pace is slower and easier. Relax with a book and a Bintang beer, or learn to cook authentic Indonesian food at one of the many cookery classes on offer. You may also want to enjoy a soothing massage at a local spa. This area is widely known as Bali’s "Dive Centre", with most destinations an easy day trip from the Candidasa area. Scuba diving equipment is available for rent in the area and along the main street of Candidasa. If you are feeling energetic, get out into the crystal-clear water and experience the colourful marine life below. In the evening, choose one of the inviting local restaurants and experience the unique cuisine of East Bali. By the way, you will not be able to ignore the presence of the immense volcano, Gunung Agung - the tallest in Bali at 3,142m (10,308 ft) - or its more northerly neighbors Gunung Batur (1,717m) or Gunung Abang (2,152m). The sea off Tulamben, Amed and Bunutan village is a world-class location for snorkellers and scuba divers. Tulamben is a quiet village and one of the best dive sites in the world, with its own wreck, the USAT Liberty. The wreck is home to a group of bumphead parrot fish, and divers occasionally meet mola-mola sunfish, hammerhead sharks and whale sharks in the waters of Tulamben and the Lombok Strait. Aside from the colourful fish and coral reef, divers might ask about the World War II Japanese wreck at Lipah. Matahari Tulamben Resort is located directly on the beach at the southern entrance to Tulamben. The resort offers diving equipment, qualified diving instructors and their own boat to take you to the dive sites. Amed is north of Gunung Seraya (1175m) and Amlapura is south of the volcano. Amed includes a 15-km stretch of coast passing Jemeluk, Bunutan, Lipah Beach, and Banyuning to Aas. Try luxurious Amankila Resort, located on a headland in Candidasa. For an early morning outing, wait for the boats returning home to the lagoon with the night’s catch, and visit the twin temples. If you stay at this resort, you can enjoy the morning cruise on Aman XII. They also offer their special Amankila massage - and for the adventurous, there's the East Bali trek or cycle tour. See more Amankila information under Accommodation. Mount Batur (with walls of 1267m to 2153m high) is Bali's second most sacred mountain, and home to the famous Lake Batur, sitting in one of the world’s largest calderas, measuring 11km by 13.5 km. Rising out of the crater - with a height of 686m and hard to miss - is a smaller volcano that goes by the same name. Near the volcano is the Batur temple, also called the Ulun Danu Temple, purported to have existed since the 10th century. After an eruption in 1917, the temple was moved to the present location in Kalanganyar, 900 meters above the Kintamani district. The villages on the rim of the Batur crater, Penelokan and Kintamani, are visited by large groups of bus tourists. But for those who really want to experience all this area has to offer, it is best to stay at a guesthouse in one of the villages, or enjoy a more luxurious stay at the Ayu Villa Bali on the edge of Batur Lake. From there you can do some excellent hiking, enjoy the view and relax at the hot springs at Toyabungkah. The best place to explore the hinterland of this scenic area is from panoramic Sidemen village, with its rice fields and adventurous Unda River, ideal for rafting. In addition to rafting, the Sidemen area is perfect for hiking, learning how to make ikat textiles, watching East Balinese dances, or just relaxing at hotels such as the Surya Shanti Villas, the Sacred Mountain Sanctuary Resort or the Nirarta Meditation Centre. Tenganan Village is one of Bali's original traditional villages. Located in the Karangasem Mountain area, this unique community's walls have protected it from the outside word for centuries. 5km beyond Amlapura (Karangasem), on the road down to the sea, you'll find Taman Ujung Water Palace - one of the last garden temples, quietly glowing in the late afternoon sunlight with the silhouette of Mount Agung in the distance. This elegant complex is one of three water palaces built in 1919 by Karangasem King Anak Agung Anglurah, the last king of Karangasem. Another water garden, Taman Tirta Gangga (Water of the Ganges) has been painstakingly restored. Should you wish to stay in the area a while, nearby you'll find a hotel, and villas and bungalows for rent. Kamasan Painting Style is a unique, classical painting style of ancient Bali. Kamasan is a village located only a few kilometres outside Klungkung, west of Padangbai. 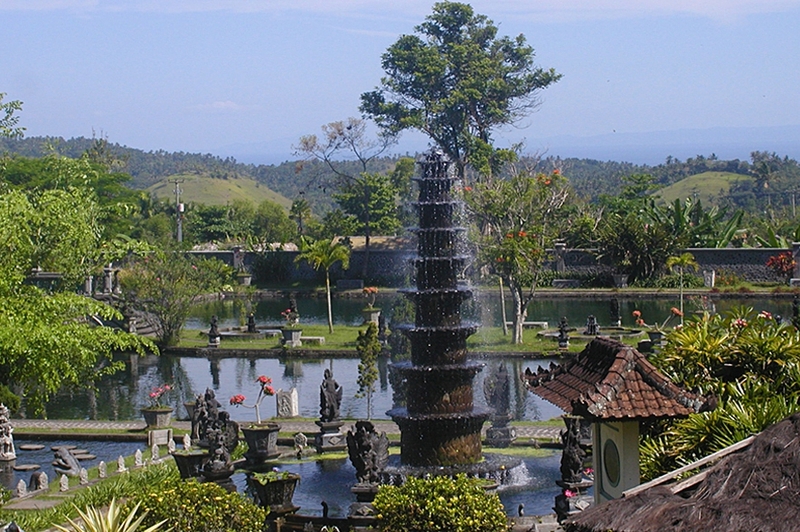 East Bali is mainly in the Regencies of Karangasem, Bangli and parts of Klungkung.